Apple dropped a lot of shiny new products and some gorgeous software to drool over at yesterday's action-packed WWDC keynote. Among them, a beautiful new retina display MacBook Pro, refreshed MacBook Airs, Mountain Lion OS X, and iOS 6, along with a few other goodies that didn't necessarily warrant an explicit mention. For the most part, we're thrilled about what we saw. But then there are all the things that didn't make it from rumor to reality. And sometimes, with a company as secretive and methodical as Apple, that can tell you nearly as much as the presentation itself. So what didn't Apple announce? Here's one that we were especially looking forward to; an SDK that let developers fill your Apple TV with glorious apps. No dice, though. So why keep the Apple TV so tightly locked up? If an Apple HDTV is actually in the pipeline and isn't just a pervasive rumor that won't die, Apple might feel that trotting off what's likely to be shared software between the white whale and the set top box would be too big of a reveal. Cupertino is also said to be chatting with three major movie studios and others for content partnerships, and those deals definitely take time. All that being said, it's still not entirely clear why Apple wouldn't just open up an SDK for regular apps. It would make sense that that would have been announced yesterday, considering WWDC is a conference for you know, developers. Perhaps that's an indication that Apple has far more work to do on the platform, so we might be left hanging on this one for a while. See above! There has been no confirmed sighting of this Apple yeti, though Foxconn head Terry Gou recently supposedly confirmed that his factories were getting ready to start manufacturing an Apple HDTV (with Siri to boot!). He later backtracked. While this is a product that might actually be in the cards, it's big enough that it would warrant its own event—and again, Apple can't do anything until it's got content providers on board. And as it goes with Apple, there's usually quite a bit of smoke before the house actually burns down. WWDC tends to be heavy on the computer reboots, and we did hear quiet chatter of new iMacs. The line's definitely due for a tuneup—how long can it go without Intel's shiny new Ivy Bridge processors?—and it's bound to get one. Just not yet. 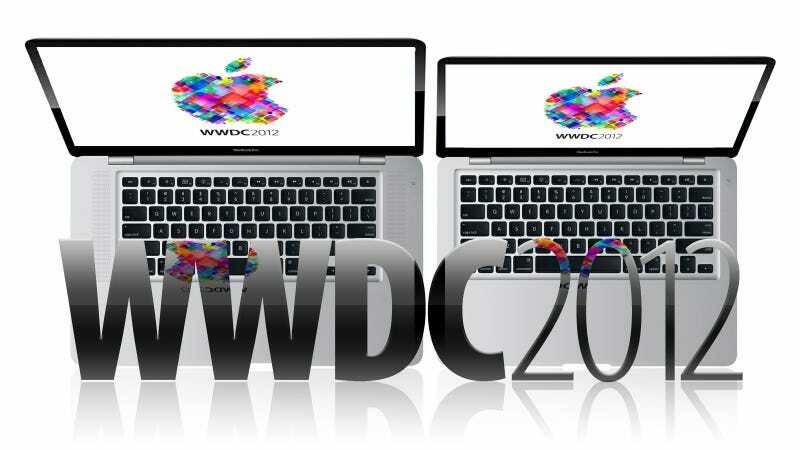 Ivy Bridge MacBook Pro and iMac Benchmarked? Citing a loose-lipped Apple exec, the NYT's David Pogue blabbed post-keynote that we might see redesigned iMacs in 2013. And presumably a spec bump even sooner. Save your desktop eulogy for another time. Are iMac and Mac Pro Redesigns in Our Future, After All? This tale was told along with the whispers that just about every single damn Mac machine would get a refresh this week. But the Mac mini was completely overhauled just last year, both inside and out, with Thunderbolt ports baked into all three models. That's more than can be said for the slightly updated Mac Pro. Besides, at this point the Mac mini is more of a niche product than ever, so even if it had gotten an update, it's unlikely to have made the main presentation. Apple showed off its own in-house Maps app yesterday, with lots of cool features like turn-by-turn navigation and 3D. But Google maintained a huge advantage when Apple didn't reveal a StreetView-type feature. That's data that takes years and years to accumulate, and a feature that Apple—and more importantly, Apple's customers—are going to have to do without for some time. Please, for the sake of everyone who's sick of getting a their iMessages days later, or not receiving them at all, can Apple just make this better? Instead of taking the lid off a better version, Apple pulled the beta from Messages. The app got some new features, sure, but we'd rather see the existing ones improved on first. Hahahahaha! Good one! This one was rumored, but if you believed it—I'm sorry did anyone believe it? Though iPhones have appeared at WWDC in the past, after last year's delay, Apple seems to be on a fall product refresh cycle. So, hold tight for this one. There might be just a few months left to wait. But with a look at iOS 6, you've got a little something to tide you over—the lovely, powerful operating system it'll be running on.